Orlando Pirates captured the imagination of South African soccer fans by beating immense odds to reach the final of the CAF Champions League. It has been a memorable campaign for the Buccaneers, as they travelled to all corners of Africa, faced some of the best footballers on the continent and ultimately faced down defending champions Al Ahly, who were equally determined to win yet another continental crown. It began with a thumping victory in Orlando. Pirates, inspired by four-goal hero Takesure Chinyama, crushed Comoros outfit Djabal Club and all but secured their place in the next round of qualifications. Sifiso Myeni also found the back of the net on the night, as the Sea Robbers launched their campaign with a five-star performance. In another 90 minutes of dominance from Pirates, they flew into the next round of the competition by securing a 9-0 aggregate win in the Comoros. Thulasizwe Mbuyane, Onyekachi Okonkwo, Ndumiso Mabena and Takesure Chinyama all scored and the first round was complete for Roger de Sa and his charges. The Buccaneers continued to show their mettle as they held on to a precious away goal in Zambia, Ndumiso Mabena’s early strike helping the cause. Back home, Pirates were struggling in the league, lacked composure and suffered from regular bouts of profligacy. However, the CAF Champions League campaign remained a bright light for the club’s fans when they beat Zanaco 1-0. The Zambian champions made the second leg of the tie difficult for the Buccaneers, equalising after Khethowakhe Masuku put the home side 2-0 up on aggregate. Despite the Zambian’s fight, Pirates prevailed, thanks to Mpho Makola’s free-kick which sent Pirates into the next round – a clash against TP Mazembe. Many expected Pirates’ journey to come to an end against the Congolese powerhouse. But Orlando Pirates showed their intent by controlling the first leg of the tie, opening the scoring through Onyekachi Okonkwo in the second minute of the game. Mazembe struck back in the first half, but Pirates did not falter, with Collins Mbesuma netting a classy double to help his side win the match 3-1. Roger de Sa’s men were able to conquer immense hurdles, which included a hostile reception, a red card and two questionable penalty kicks for the home side. This fighting spirit was a sign of things to come for the Buccaneers, a result which may have given them the impetus to strive for glory. In the searing heat of El Gouna, Orlando Pirates demolished a fatigued Al Ahly side 3-0, in a result which seemed unbelievable for most. Played during Ramadan and in an empty stadium due to the spreading political unrest in Egypt, Al Ahly struggled to match the Buccaneer’s pace and power. Pirates’ historic win began with a goal from Thandani Ntshumayelo, while the electric Senzo Meyiwa made it 2-0 and the ever-dependable Andile Jali sealed the emphatic victory in the seaside town. Lennox Bacela, initially struggling to win over the Pirates’ faithful, stepped up to the plate by inspiring the Buccaneers to yet another dominant win over an Egyptian club, as he provided an assist and scored a goal during the 4-1 massacre. But fatigue began to kick in and the long flight to troubled Egypt took its toll. Pirates succumbed in El Gouna. Roger de Sa’s charges needed a win to ensure progression into the semi-finals, but struggled to match a driven Zamalek outfit, which gained revenge for their 4-1 humbling in Soweto. Cracks had begun to appear in Pirates’ path, with an away trip to the DRC next up for the club. It seemed as if the wheels may have come off for Pirates, as they struggled to contend with a dusty, bumpy pitch in the DRC, eventually losing 1-0 due to a Dimitri Bissik second half wonder-strike. On the cusp of a semi-final berth, Pirates fans would have to wait until the final match day to see if their side could reach the final four. A 0-0 draw is not normally celebrated, but Pirates solid display against an improving Al Ahly side helped them finish second in the group, largely thanks to Zamalek’s 4-1 win over AC Leopards in Egypt. However, finishing second meant Pirates had to face an in-form and deadly Esperance de Tunis in the semi-finals. Surprisingly defensive, Esperance had to contend with a rampant Pirates side in Orlando, who scuppered the few chances they created during a largely dull opening leg to the semi-finals. The clubs traded blows during the match, but were eventually happy to determine the tie in Tunis, a game Rooi Mahamutsa will likely never forget. 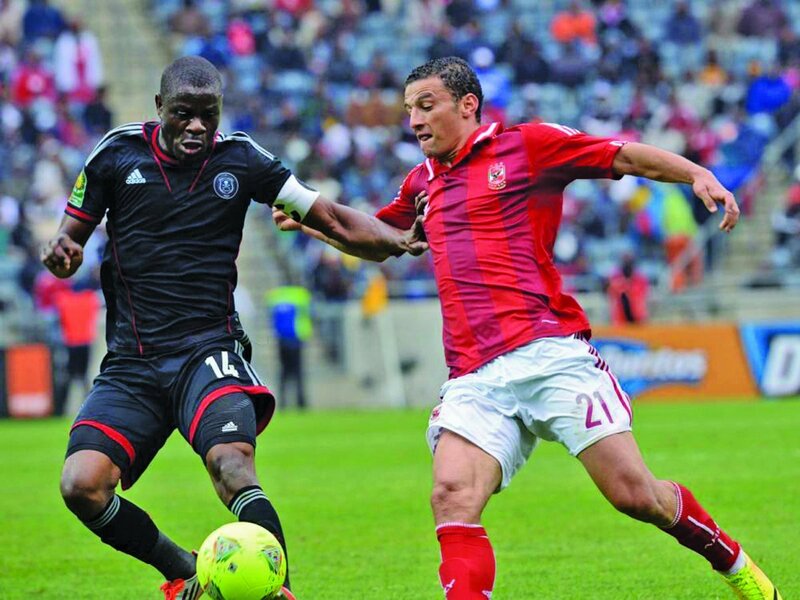 The Tunisians held all the aces in the deck when hosting Pirates in the second leg of the semi-final tie. Home form which would send shivers down the spine of any visiting side, a wealth of attacking talent and an impressive CAF Champions League record were enough to hand the Tunisians the favourites tag. Pirates, even with lasers in their eyes, an injury-ravaged defensive line-up and mounting odds, prevailed as Rooi Mahamutsa’s powerful header in the second half shifted the tie in their favour. Iheb Mskani’s equaliser set up a tense last 15 minutes, but the referee’s final whistle sounded in Tunis, meaning Pirates had completed the upset and catapulted the club into the CAF Champions League final. In the final the Pirates, champions in 1995, put up a spirited fight, but Ahly’s second goal seemed to make them lose heart inside a packed Arab Contractors Stadium in Cairo. They went down fighting 2-0, ending a dazzling 2013 campaign.